Rolling fields of Japanese irises in full bloom - a lovely illusion of wilderness and a perfect contrast to the "formal" parts of the Imperial Palace East Garden. Despite having walked around the Imperial Palace grounds on my previous trips to Tokyo, this was the first time that I actually entered the East Garden. I'm not quite sure why - but better late than never, I guess. This 52 acre park is surrounded by deep moats, dramatic stone walls, and reached through several stone bridges and gates. It was built on grounds that belonged to the Edo Castle, the seat of the Tokugawa Shoguns that ruled Japan from 1603 to 1868. After that, the Meiji Restoration re-established the Imperial family's power, Edo was named Tokyo, and the Imperial family moved here from Kyoto. The palace has been rebuilt at least twice, first after a great fire in the late 19th century, and then due to destruction during the World War II. The East Garden forms its own area on the side of the actual palace complex, and is the only part of the Tokyo Imperial Palace grounds that is open to public. Seimon Ishibashi bridge leads to the main entrance to the palace (the entrance to the gardens available to public is on the east side of the palace grounds). 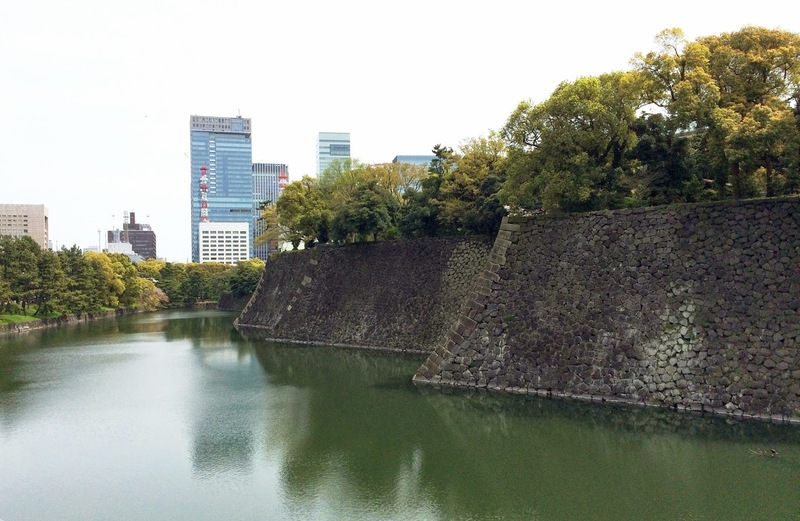 The huge moat remains from the Edo period, together with several beautiful guard towers. The monumental stone walls are so beautiful - I love the arched (do you call them that...?) corners, they are so typically Japanese in form. The adjective most often used to describe these gardens seems to be "manicured" - with a hint of... I'm not quite sure what, arrogance maybe, or some kind of imagined superiority. I'm not sure why. I mean, what would you expect from a garden just outside the palace and residence of Emperor Akihito, the 125th emperor of his line? Not an avant garde patch with experimental plantings, but a garden that transmits the permanence and continuity of the imperial office and the Japanese culture through their traditional garden design - definitely not one that is just "accidentally there". The wilder parts of the gardens, closer to the outer edge, with meadows filled with Japanese irises under cherries, most of which had already finished flowering. Iris japonica, such a perfect plant for the Emperor's gardens. The irises and cherries were nearly done with their blooming; kerrias, azaleas and wisterias were just beginning theirs. One more picture of the Japanese irises... I loved the wild and free feeling of some parts of the gardens. Anyway. The walls and moats form a strong, impressive frame to the garden as you enter the garden - they can't be seen from inside, but the impression stays in your mind. In the actual garden, paths linger around beds of bearded irises form like rivers through the garden; hedges of azaleas and rhododendrons are closely trimmed into sculptural forms; behind ponds, they disappear into a wilderness of rolling fields filled with Japanese irises. The whole effect is based on the contrast of the contained and the wild. All carefully planned, executed and maintained, of course - but then, what else would you expect of a garden of this rank? Only very few cherries were still in flower here, but the buds of the wisteria (see pergola in the middle of the picture) were swelling, and will be gorgeous just in a couple of weeks. A tiny waterfall run down into from the wilder parts of the garden into the pond below. Yet another angle on the pergola - several artistically pruned pines were part of the gardens. The lovely Suwa no chaya tea house, also from the Edo period, is part of the gardens - unfortunately (and understandably...), no tea was served here to the strolling visitors. Entrance to the peony garden in Ueno Park in Tokyo. Last week was our spring break and we spent it in Tokyo, almost exactly two years since our previous trip there. This year's spring had been warm, so all things green had developed a bit further than then. Still, we managed to catch loads of sakura trees in full bloom and even sit under then, with falling petals swirling down like snowflakes around us. Old ladies taking a rest in the shade. More about the cherries later; another glorious favorite of the Japanese, the tree peony, was also just coming to full bloom in the gardens. While strolling around Ueno Park, the oldest of Tokyo's many public gardens, we popped into an area specifically dedicated to these sumptuous bloomers. 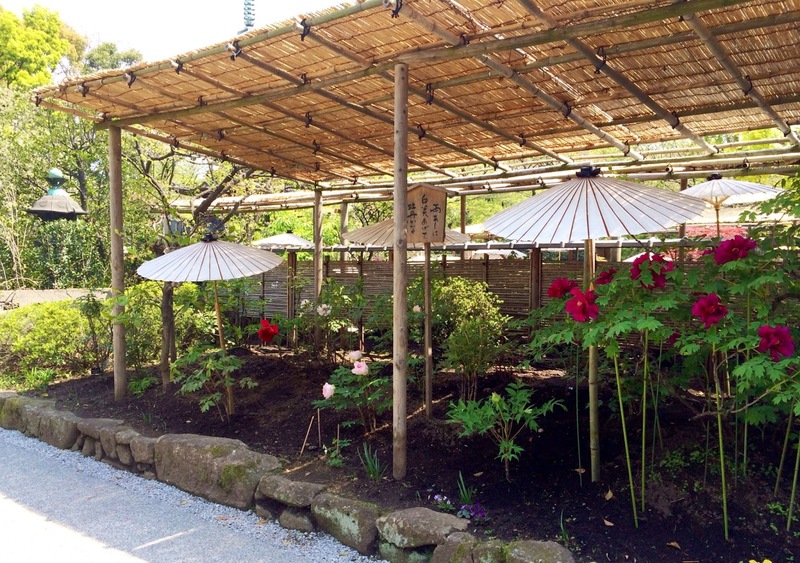 It felt like we were transported back in time; the wooden signs showing the names, and the bamboo shelters and paper parasols protecting the flowers were just like in some old pictures I'd seen, depicting "peony gazing" in Japan during long gone eras. 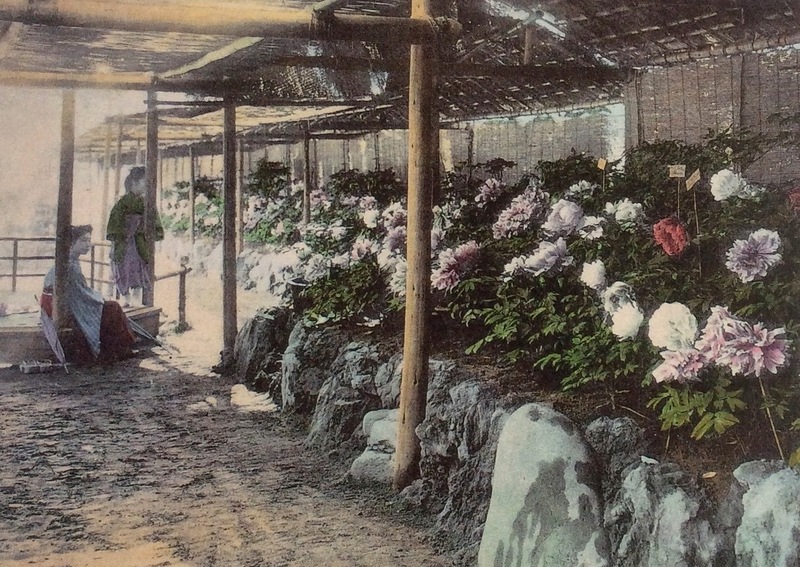 A hand-colored 19th century photo of ladies gazing peonies in Tokyo - maybe even in the Ueno Park? Tree peonies are thought to have arrived to Japan from China already in the 8th century, but their cultivation became widely popular first in the Edo Period (1603 to 1868). Due to this long history, they are often depicted in visual arts and poetry, representing good fortune as well as a righteous and noble spirit. Mainly older Japanese ladies and gentlemen were admiring the huge peony blooms, frequently stopping to discuss their specifics along their route around the rised flower beds. Many of them took countless pictures of the flowers, with huge lenses for recording their minute details. It felt just like they'd never seen such beauties before, even if their ages clearly showed that it couldn't be the case. This was all about the peonies and nothing else; very few other plants were allowed to mingle and distract from the stars of the show. A couple of weeks, and the fleeting glory of the peonies is over; just like the sakura, maybe the favorite flower of the Japanese, they are such a great reminder of how nothing is everlasting. A grocery store at the Yanyue Hutong in Beijing, just a short walk from the Tiananmen Square and the Forbidden City (or Palace Museum, as it is more officially called today). A young father with his daughter in one of the alleys in the Yanyue Hutong. A gathering point near the police station (picture below) - I took these photos in the morning; the chairs and benches were filled with retirees when the sun came out in the afternoon. A street side garden with chillies, gourds and aubergines, still going strong in the end of October. Even the inner courtyards seemed to have gardens, as tops of trees and diverse edible climbers peeked above the walls. The ends of the tiles carry the round character of "shou" for longevity, and the half-round end tiles between the shou-character ones are in the form of a bat, which represents the wish for good luck. Anyway, the article reminded me of the week in last October, that we spend living in the middle of one of the less know of these hutongs, in a small hotel built into one the historical courtyards (yes, we are "adventurous" like that; I'm always on the hunt for something a bit different, sometimes to my family's delight and sometimes - not). Luckily, this stay was a success; the tiny hotel was suitably historical and pretty (if somewhat difficult to reach with a taxi & difficult to get one from), the personnel extremely friendly and helpful, and the chef cooked us the most delightful meals and even arranged a birthday dinner complete with a cake and candles, when she heard that my youngest had her 12th birthday one of our days there. A gateway into a cluster of residential buildings - a wedding had taken place here recently; the symbols for "double happiness", a typical well-meaning wish for newly weds, were still hanging on both sides of the doorway. Why a hutong, then? Hutongs could be described as low-rise courtyard house communities, that have been part of the traditional life and culture of Beijing and other old cities in China for hundreds of years. The word hutong means a lane or an alleyway, and comes from a Mongolian word for "a water well" - in the 13th century when Mongolian rulers took over China, they even imported their way to dig a well and then build courtyards with buildings to live in and lanes around them. These clusters of courtyard houses, often with finely decorated gateways, are called siheyuan. Despite being hundreds of years old, a huge number of hutongs have been bulldozed to give place for modern housing - so many, that in 2003 the Human Rights Watch actually placed them on their watch list as an attempt to help their desperate residents. Today, some siheyuans have been snapped up by the new mega-rich of China, which means that the actual buildings are saved, but the communal life of the hutong is gone forever. An entrance and a glimpse into yet another cluster of courtyard houses - I wasn't brave enough to ask if I could go in to see more. A local small business for steamed buns, sold piping hot from the back of the bicycle. Wandering through the small alleys, I can understand how some residents gladly exchange their dwelling for modern apartments - many of the buildings were extremely run down and probably cold and draughty in winter and hot in summer. Electricity wirings seemed to be of questionable quality, and I would think that sanitation would be a problem, too, given the looks of the environment. But with right resources and skills, hutongs with their historic houses could be as pleasant to live in as they are charming. So I hope that not just the Prince of Wales's Foundation, but also their Chinese counterparts within cultural protection and heritage restoration get their act together, and work to save these living testimonies to Beijing's long history. ... presenting two magpies and cherry blossoms. Magpies represent both a happily married couple and are also seen as a messenger for good news. Coupled with the blossoms, a symbol for spring and good news, they together express a wish for "double good news or good fortune" - what a lovely welcome to a home. And a gateway into what I think is a lush courtyard, complete with a persimmon tree full of fruit towering above the walls. And just one last picture, from the courtyard of our little hotel, filled with magnolias, wisterias and other flowering wonders. We might have to return in springtime some day.